← VALENTINES SAVE THE DATE! Dry shake, then shake with ice, then strain in to a sour glass. Garnish: None needed in my opinion, but a cherry and orange slice are typical. PLEASE NOTE: This photo of a Whiskey Sour, although in my favorite coupe glass, is actually incorrect. It should technically be served in a Sour glass. This drink is a classic sour. 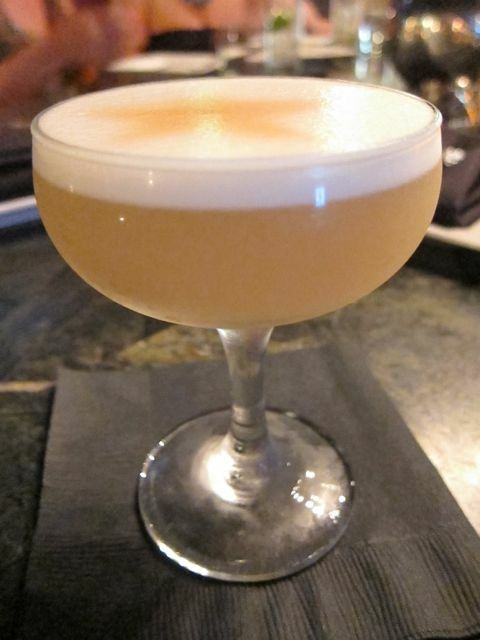 Sours belong to one of the old families of original cocktails and are described by Jerry Thomas in his 1862 book, How to Mix Drinks as mixed drinks containing a base liquor (bourbon or some other whiskey in this case of a whiskey sour), lemon or lime juice, egg white, and a sweetener. To me a Whiskey sour, when done correctly, is utterly delicious. Sadly not all places will use egg, but if you go to one of the many mixology bars popping up around the city you can assume they will make it correctly. The egg white is really what makes the drink so good to me! It’s creamy, slightly sour, and utterly delicious in it’s simplicity. I have tasted fantastic versions of this classic at Seven Grand and Bar|Kitchen in Downtown and Bar Chloe in Santa Monica, to name a few. There are of course hundreds of locations around the city that will make you a great one. Just be sure they use fresh ingredients and egg white in their recipe. Go get one tonight and ENJOY! Yum! I’ve been enjoying this for about forty years now and in my opinion you can’t beat the classic recipe. I agree, the egg is essential. SO GLAD you enjoy it with the egg white, for some reason many bartenders miss this step and that’s what ‘makes’ the drink in my opinion.